The fraudster is looking to slide your credit card through an electronic reader, “skimming” your identification and your credit card numbers in order to use it later. “Data is King”, says Linda Webb, who has been fighting fraud for over 25 years. 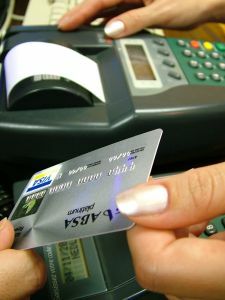 The fraudster capitalizes on the holiday season because most people are in a hurry and are not looking for the fraudster who uses these cheap card reading devices to steal your information. These fraudsters using quick slight of hand tactics have even skimmed The Fraud Dog’s card. sure to check your credit card bill. Also even a $1.00 charge that doesn’t belong on your card is worth reporting, because you don’t want the fraudster using your card months later, says Linda Webb, the Fraud Dog.